Ten years ago today I got an iPhone. I had wanted one as soon as it was previewed by Steve Jobs, but wasn't going to take time off from work to stand in line to buy one on the first day it went on sale. As it happened, a friend and his son were in line at an AT&T store and asked if I'd like them to buy one for me. I drove to their house that evening, gave them a check, and went home with my iPhone. Just for grins I'm writing this on my current iPhone—an SE, as I favor the smaller size, pocket friendly device—with Dropbox's built-in text editor. How it gets from there to my blog is another story. I had created a diagram like the one here, which elucidates the rules cycles of Rock Paper Scissors Lizard Spock as seen on The Big Bang Theory, but then, of course, found this one in the Rock Paper Scissors Wikipedia entry. Note how one cycle of five goes clockwise around the perimeter of a pentagon while the other traces an inscribed star in the opposite direction. It's a vast world, with much to clarify and explore. It's my fondest dream that someone, one of the younger readers of this book, I hope, will be able to voyage across it and illuminate it better. Beginning with Democritus, the original atomist, and working through classical and modern greats, we arrive at the crux: the fundamental incompatibility of quantum mechanics and general relativity. Rovelli explains the problem and how loop quantum gravity, his choice of competing theories, reconciles them. 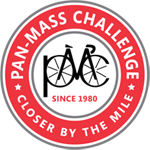 For the eighteenth straight year I’ll be riding in the Pan-Mass Challenge which, through the Jimmy Fund, raises money to support research and treatment at the Dana-Farber Cancer Institute. You can contribute online if you’d like to support my effort.